Nutrient elements that show their deficiency symptoms on the older leaves of plants first – Nitrogen, Phosphorus, potassium, Magnesium and Zinc. Nutrients elements that show their deficiency symptoms on the young leaves of plant first. Corn – In young corn, nitrogen deficient is characterized as a stunted, spindly plant with light green foliage. In older plants nitrogen will move out of the lower, older leaves into the new growing plants. The tips of the older leaves will yellow and the yellowing will follow down midrib in a typical V-shaped pattern. The leaf will eventually die. Small Grains and Grasses – Nitrogen deficiency of small grain and grasses can be described as plant that are erect, spindly and poorly tillered. The lower leaves turn yellow and die from the tip to the base. Phosphorus deficiency symptoms in the field are difficult to interpret because there are no outstanding specific external symptoms. Phosphorus is translocated in the plant. At maturity, plants have the largest portion of phosphorus in the seed. Corn – Phosphorus deficiencies of corn are characterized by slow, stunted growth and dark green color. Sometimes the lower leaves and the stems have a tendency to become purplish. Small Grains and Grasses – Phosphorus deficiencies of small grains and grasses are characterized by slow grown and lack of tillering when plants are dark green. Legumes – The chief symptoms of phosphorus deficiency are a retarded rate of growth and spindly plants, with leaves turning dark green or bluish-green. Potassium deficiency is perhaps the most outstanding and easily recognized symptom of legumes. Soybeans – the first sign of potassium deficiency in soybeans is the irregular mottling around the edges of the leaflets. These chlorotic areas soon merge, forming a continuous yellow border around the tip and along the sides of the leaves. The marginal firing often spreads to include half or more of the leaflet area, while the center and base of the remains green. Alfalfa and Sweet Clover – Small white spots around the leaf margin fist appear on the green leaves. Later the tissue between these spots becomes yellowish-green to yellow and finally dies. Generally, the symptoms are more pronounced on the lower leaves. This is because potassium is translocated, like nitrogen and phosphorus, but not to the same extent. Winter-killing of alfalfa also indicates a potassium deficiency. Corn and Sorghum – The first sing of potassium deficiency in corn or sorghum is a slower rate of growth. The leaf edges and tips become dry and scorched, with the rest of the leaf showing yellowing stripes. The lower leaves are affected first. Lodging of corn at maturity is a final result of a potassium deficiency. Small Grains and Grasses – Small grains demand less potassium than corn and legumes. There is one common potassium deficiency symptom – the edge scorch of the leaves. Magnesium is translocated in the plant; therefore, magnesium deficiencies are frequently found on the lower leaves of plants. Corn – The first magnesium deficiency symptom is a striping or chlorosis between the veins and, if the deficiency is severe, a crimson red color frequently appears on the lower leaves. Potato – In potatoes, an orange-yellow coloration appears the margin of the lower leaves and along the veins. Corn – Two to three week old corn plants develop pale yellow stripes on each side of the midrib of lower leaves. These yellow stripes start near the base of the leaf and extend about 3/4 of the length of the leaf. Later, leaves may become reddish-bronze in color and eventually die. Shortening of internodes and stunting also occur. Small Grains and Grasses – On oats and wheat, zinc deficiency symptoms occur as thin growth and pale green color. The older leaves show collapsed areas at margins and leaf tips are grayish in color. Actually, small grains and grasses are less sensitive to zinc deficiency. Legumes – Zinc deficiency of alfalfa can be described as yellowing between the veins, particularly in the older, lower leaves. Shortened stems resulting in bushy groups of leaves are another zinc deficiency symptom of legumes. Soybeans are more sensitive to zinc deficiency than alfalfa or clover. Sulfur deficiency symptoms resemble those of nitrogen. However, with a diminishing supply of sulfur, a distinction may be sharply drawn: on most plants, young leaves are light green to yellowish in color, with even, light colored veins. Sulfur deficiency plants are characteristically small and spindly with slender stalks that tend to be woody. They also have decreased root development. Alfalfa and other legumes are particularly sensitive to sulfur deficiency. Manganese – Veins retain dark green color outside of dead spots. Manganese Deficiency Symptoms – In general, plants with net-veined leaves (legumes) that develop chlorosis in the interveinal tissues while the veins remain green are known to have a manganese deficiency. The first symptom of potatoes and soybeans is small pinhead-sized black specks parallel to the main veins. Plants that have parallel veins, such as small grains, develop a general chlorotic condition and secondary symptoms such as grey speck of small grains. Iron – Veins retain green color with loss of color between veins. The earliest stage of iron chlorosis may consist of a generally pale leaf color without veinal patterns. The next stage consists of an interveinal chlorosis in the leaves. There is no gradation of green coloring within the interveinal areas as in the case of zinc and manganese deficiency symptoms. At the most severe chlorosis stage, finer veins and even the larger veins are yellow. These deficiency symptoms occur on the young leaves of the plant, since iron is immobile in the plant. Sorghums are the most sensitive to iron chlorosis. 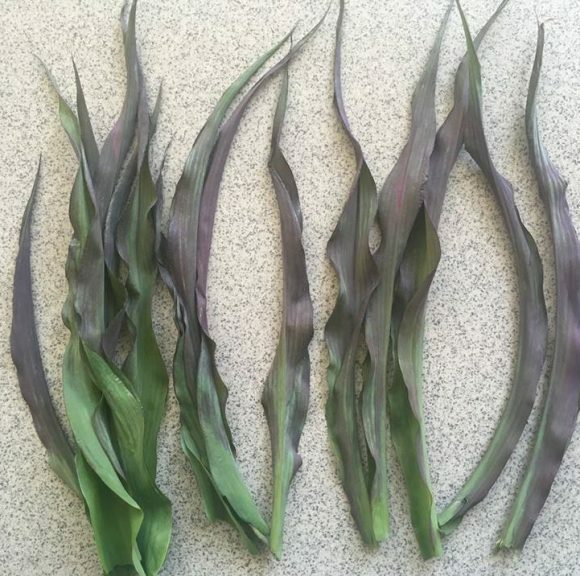 General Deficiency symptoms of oats are a bluish coloration of the outer glumes and the grain produced is pinched. In legumes, molybdenum deficiency symptoms show up in about the seventh week. The leaves turn pale with progressive discoloration from greenish-yellow to pale yellow. In most plants, calcium deficiency causes reduced root growth and frequent rot rotting. The roots are affected before the tops show any symptoms of calcium deficiency. In moderate stages of deficiency the young leaves become distorted, fail to grow and show spotting or necrotic areas. Since calcium is not translocated, the growing points and young leaves are affected instead of the lower leaves. Boron is largely immobile in plants, causing stunting of the younger growing parts of plants. Sugar Beets – Heart rot of sugar beets is caused by a boron deficiency. It is first noticed in midsummer after the sugar beets have attained considerable size. The first symptoms are crosschecked petioles and misshapen leaves. The petioles and midribs of the misshapen leaves become twisted. The color of the newer leaves is dark green until they start to disintegrate, when they turn yellow, brown and black. Boron deficient beets also appear to have been stepped on because the leaves grow out in a horizontal position rather the vertical position. Corn – Boron deficiency of corn causes a striping of the upper leaves and barren stalks. Alfalfa – In alfalfa, the top of the plant becomes yellow or reddish while the lower leaves stay green. The plant has an umbrella – like appearance. Seed production is very low when boron is lacking. Copper – Most copper deficiencies are concerned with organic soils. The youngest leaves of corn become light yellowish-green near the base of the leaf and the tips become necrotic when deficient in cooper. Oats, wheat and barley have similar symptoms. Deficient alfalfa plants have faded green color with a grayish cast, internodes are shortened and necrotic areas appear on the upper leaves. The youngest leaves first wilt and subsequently can become chlorotic and bronze-colored.